On a recent afternoon we found ourselves in Nihonbashi a little after noon. 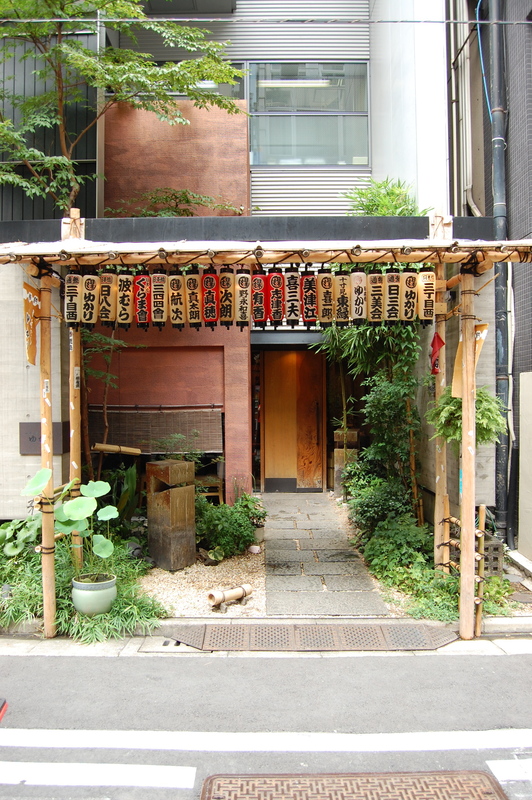 Just around the corner was one of our favorite restaurants in the city, Nihonbashi Yukari. Nihonbashi Yukari is a kaiseki/kappō restaurant. Behind the counter on most days is the third-generation chef, Kimio Nonaga. We actually tried coming in last week but when we called to make our reservations Nonaga-san said that he was going to be at NHK that day filming for a television program. When Nonaga-san is not in the house his father, the second-generation chef, fills in. We were thrilled when we opened the door to see Nonaga-san behind the counter. We had just seen several people leaving the restaurant so our timing was perfect. The counter was just being cleared and we were seated just in front of the former Iron Chef champion at the best seats in the house. 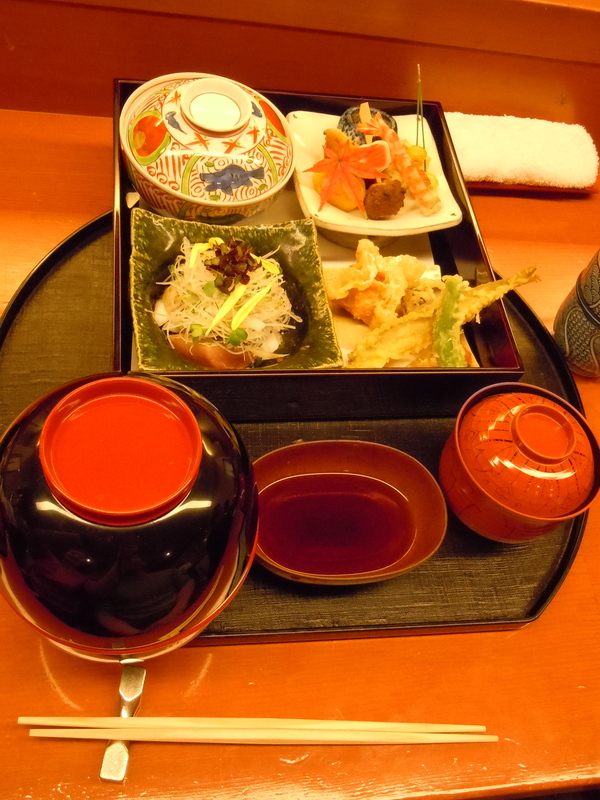 Usually we pre-order our lunch, the Yukari lunch box which is like a mini-kaiseki meal and a great bargain at 3,500 JPY. Today as we were walk-ins it was our first time to order lunch off of the menu. There is a wide variety of dishes to choose from including tempura, grilled fish, simmered pork, sashimi platter, and much more. We are big fans of a special nattō taré (sauce) that was created by Nonaga-san. This sashimi course was in addition to the regular lunch. Three types of sashimi, seared scallops, katsuo (skipjack tuna), and kanpachi (yellowtail) is topped with julienned daikon, shiso, myoga, onion, kaiwaré (daikon sprouts), and baby shiso. The dressing is a blend of the fermented soybean dressing which adds a rich umami and deep flavor to the dish. Anago bones are deep-fried and pulverized and sprinkled on which adds an unexpected and welcome crunch to the dish. 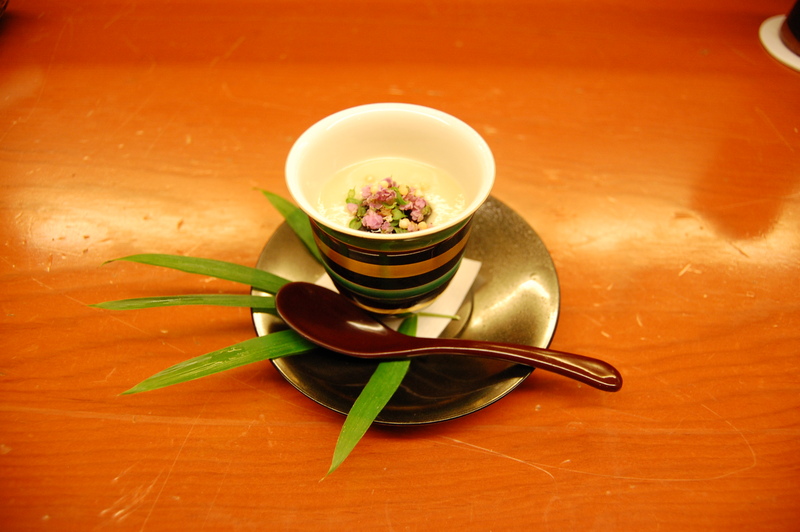 The dish is a beautiful dish for summer, Edo Kiriko. 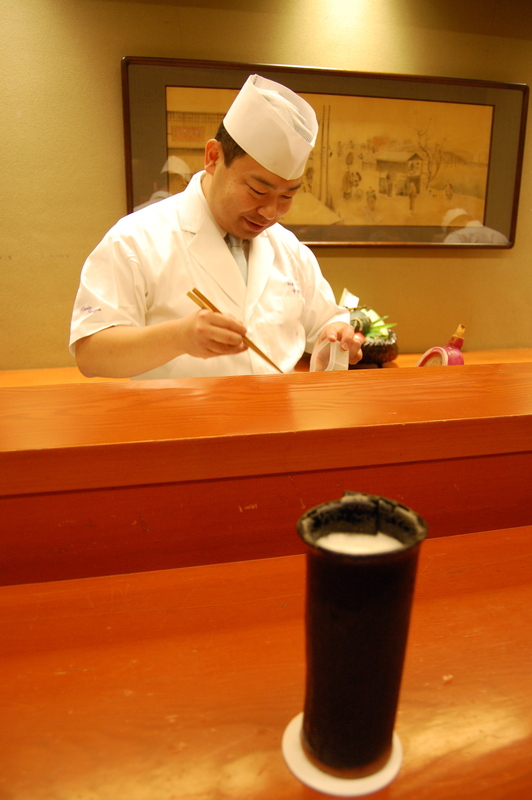 Anago is sea eel and is often seen at the traditional sushi counter in Japan. 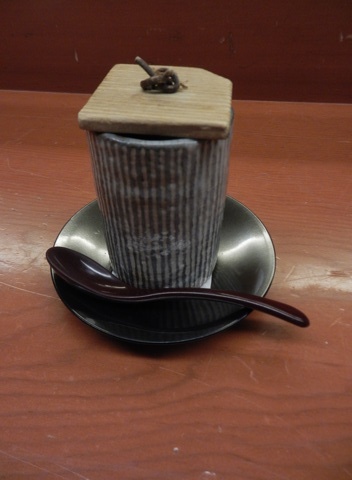 At Nihonbashi Yukari the anago is simmered until tender and then served over rice in a lacquer box, jyubako. The anago is so soft that it melts in your mouth. The sauce is ever-so-sweet, not cloying as is often the case with unagi (fresh water eel). There were a few offerings for simmered fish this day. Shinji went with meitagarei which is a type of flounder. The simmering sauce is not made fresh each day but is passed on day after day over the years. It has a deep flavor from it. 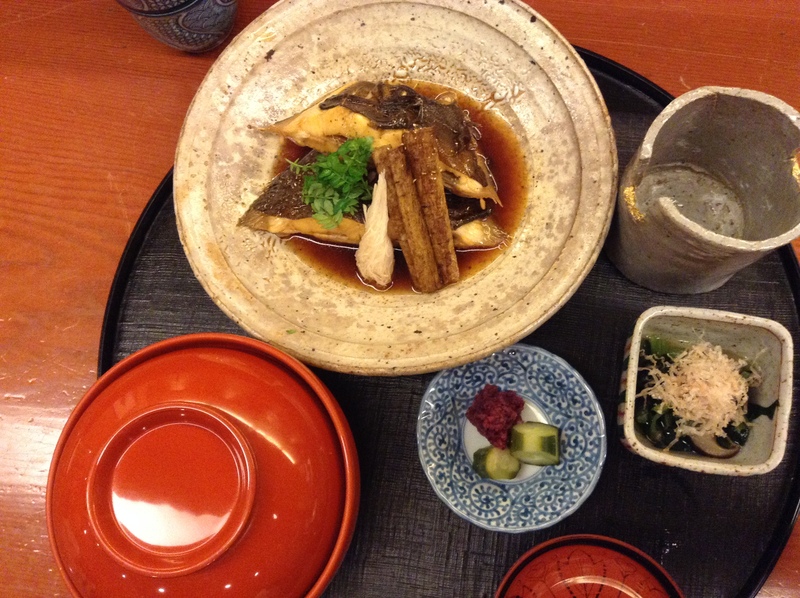 Nonaga-san said that many different types of fish are simmered in this sauce, hence the depth of flavor. This is something that would be hard to recreate at home, we pondered aloud. Nonaga-san suggested we try it. He said to save the broth and to put it in the fridge. I love his positive and encouraging attitude. The rice served with the simmered fish has julienned fresh ginger and abura-agé (deep-fried tofu) in it. Refreshing for the summer, and we find inspiration in another dish we will try at home. Nihonbashi Yukari is just minutes from Tokyo Station’s Yaesu Guchi. It is possible to walk-in, but we recommend reservations. Within about ten minutes of being seated the counter filled up again and most of the tables in the restaurant were also full. 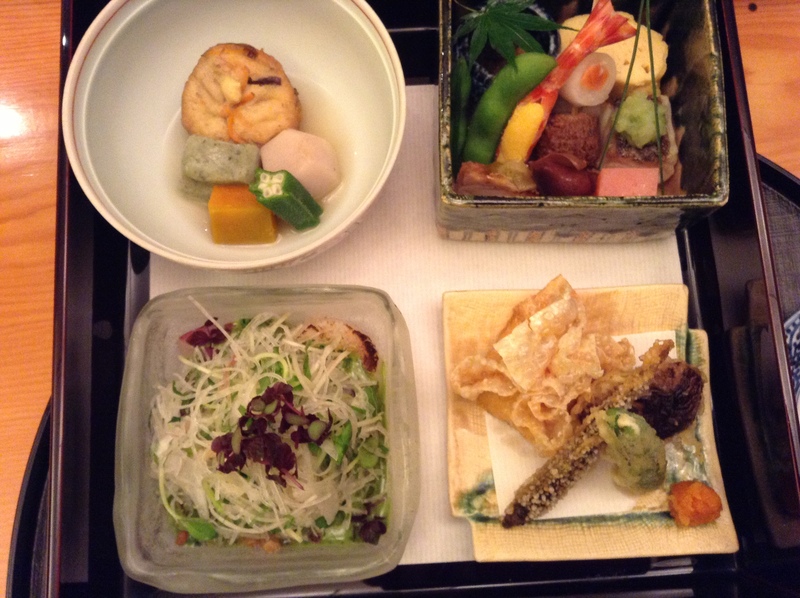 Nihonbashi Yukari is one of my favorite restaurants in Tokyo for a kaiseki meal. Chef Kimio Nonaga is the 2002 Iron Chef champion from the original series. I’ve included many Yukari Gozen lunches on this blog and it’s a beautiful way to taste seasonal ingredients exquisitely presented. 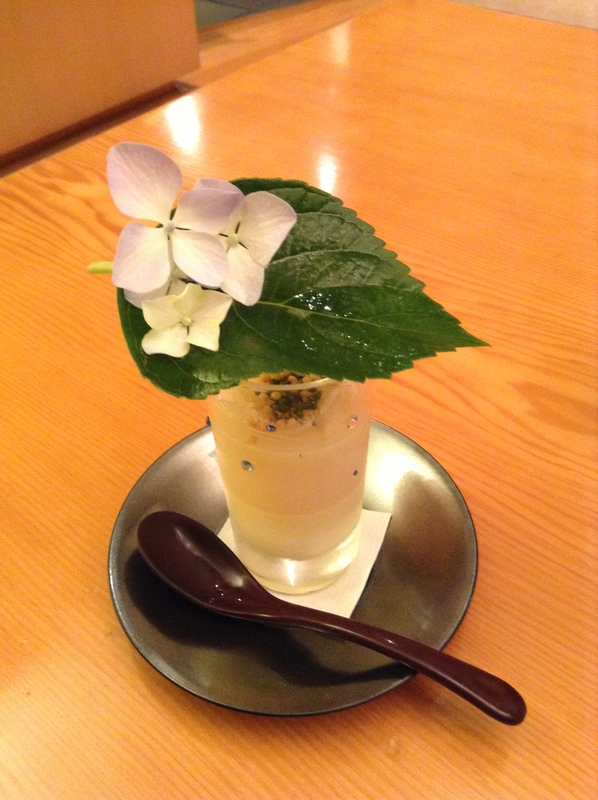 This lunch in early June starts with a chilled chawanmushi topped with a hydrangea flower picked from the small garden in front of the restaurant. Hydrangeas (ajisai) are blossoming all over Tokyo but it’s an unexpected treat when it is presented with your meal. A gentle reminder to the time of year. Chawanmushi is a savory egg custard, usually served hot. But on this hot summer morning he serves a very soft custard that is topped with a thick slurry. It’s a unique flavor and texture that I’ve never had before and I have a hard time imagining what it could be. Nonaga-san says that it is dashi mixed with Jersey mozzarella cheese made in Tokyo at Isonuma Farms in Hachioji. It adds to the dish a creamy texture. 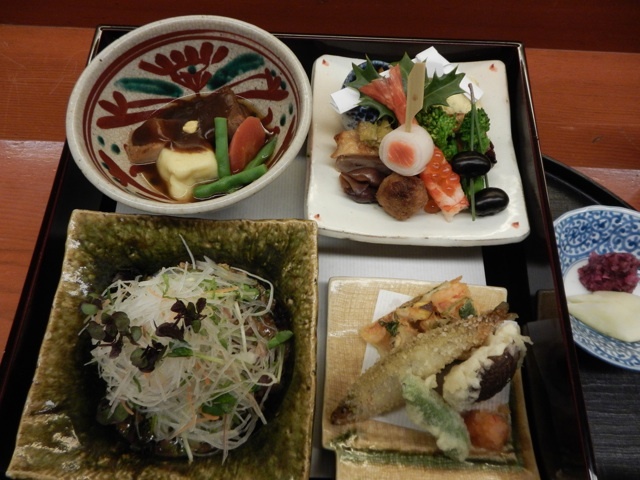 Here is the lunch, presented in a lacquer box and is a generous lunch, so come hungry. Another look at the lacquer box with all of its components. 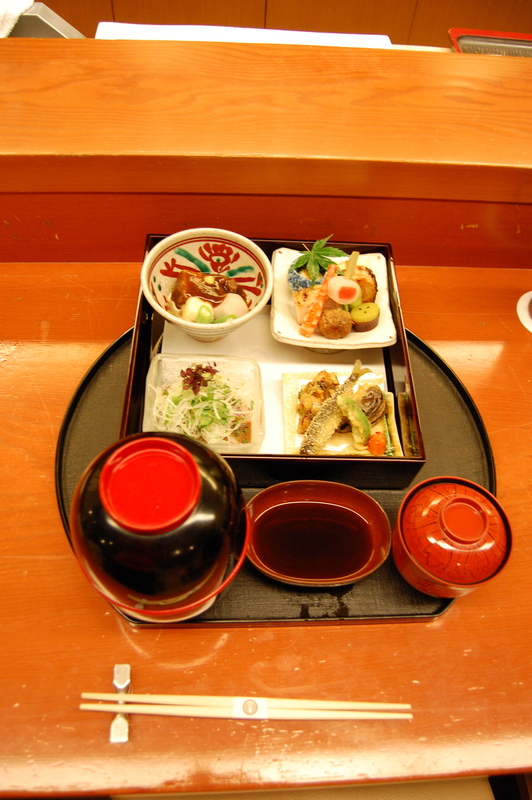 A fried course, a sashimi course, a simmered course, and the top right box which includes small bites prepared in a variety of ways. Another overview of the lunch including young ginger rice, miso soup, and pickles. Top left is the simmered course with ganmodoki (deep-fried tofu) and nama fu, a lovely wheat gluten that is a treat as at our home we only have the dried version of fu which doesn’t have the chewy texture of nama fu. Top right are the small bites including a savory fuki miso garnished with pine nuts, yokan sweet cake made with amazu (tart plum vinegar), and a sweet egg omelet. Bottom left is the otsukuri (sashimi) course of scallops, horse mackerel, and North Pacific giant octopus topped with vegetables and a creamy green dressing made from shiso. Bottom right is the deep-fried course of shishitō and shiitake tempura, baby ayu that is covered with sticky rice balls and deep-fried and yuba stuffed with shrimp paste and deep-fried. As you can see, it is a variety of colors, flavors, and textures. 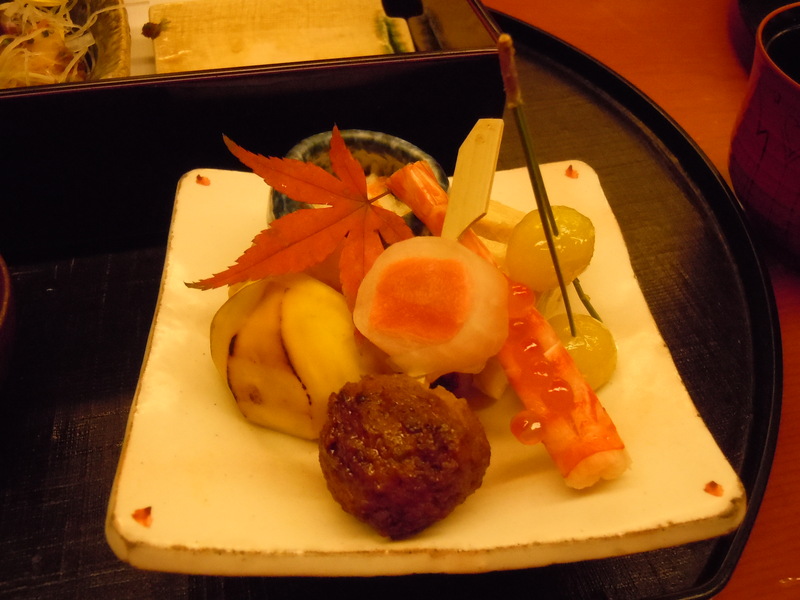 For those who want to experience kaiseki cuisine this is a great lunch in Tokyo. 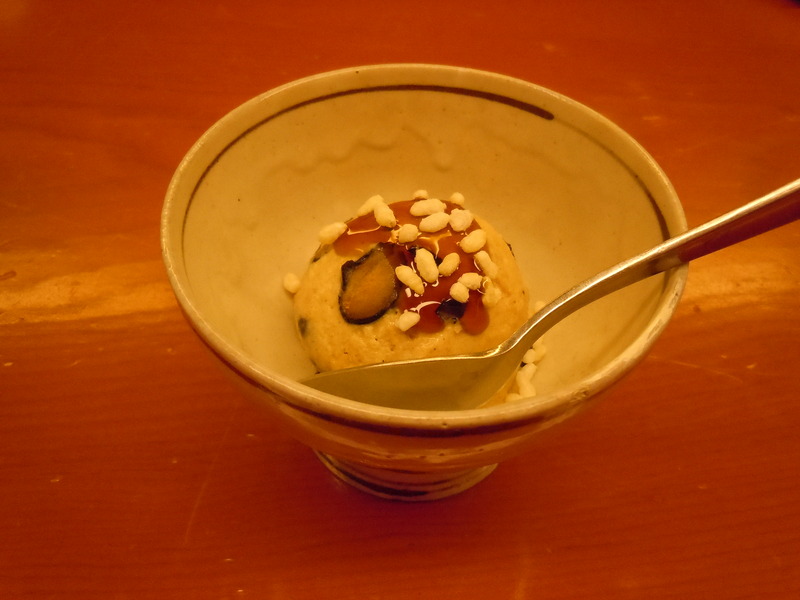 Nonaga-san is known for serving desserts, not just cut fruit, at the end of each meal. Today it is a mattcha babaloa made with yogurt. 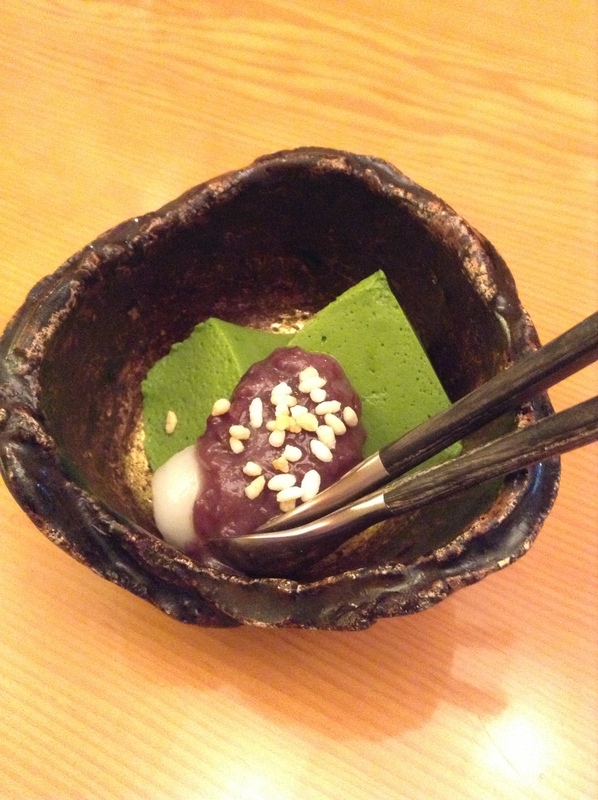 It is served with a creamy, sweet azuki bean paste and sticky rice balls. The entrance to Nihonbashi Yukari. Can you see the lavender hydrangeas that were used for the first course? If you come, tell Nonaga-san that Yukari sent you. 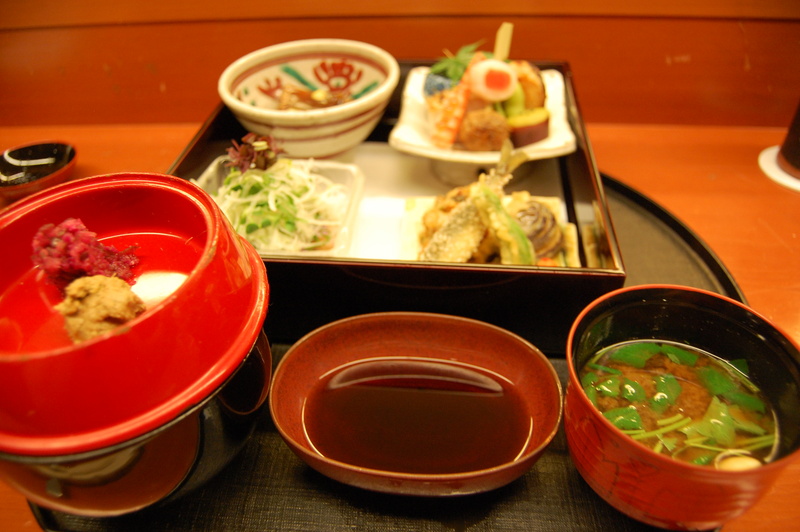 The recommended lunch is the Yukari Gozen as seen here for 3,675 JPY. It must be reserved in advance when making your reservation. Alternative lunch options include sashimi, tempura, or grilled seafood. 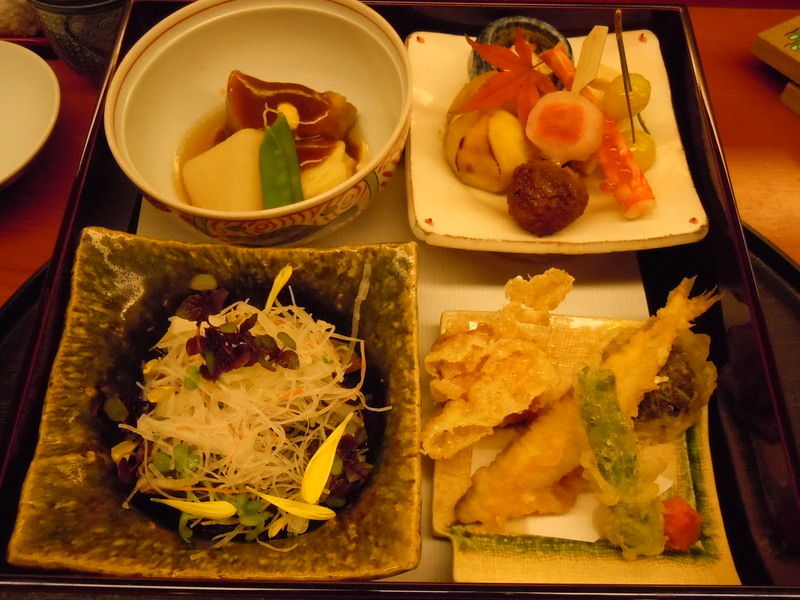 Nine-course kaiseki dinner starts at 10,500 JPY, a bargain and great value for a kaiseki evening. Nihonbashi Yukari is a five-minute walk from Tokyo station’s Yaesu exit. It is also around the corner from Takashimaya’s flagship store. Nihonbashi Yukari is one of my favorite restaurants in Tokyo. Chef Kimio Nonaga is the 2002 Iron Chef Champion, from the original series. 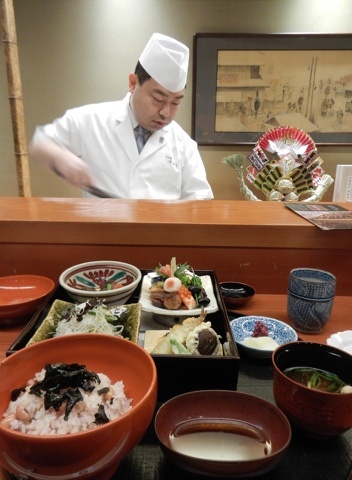 He is the third-generation chef of a kaiseki restaurant that is located in the historic district on Nihonbashi. 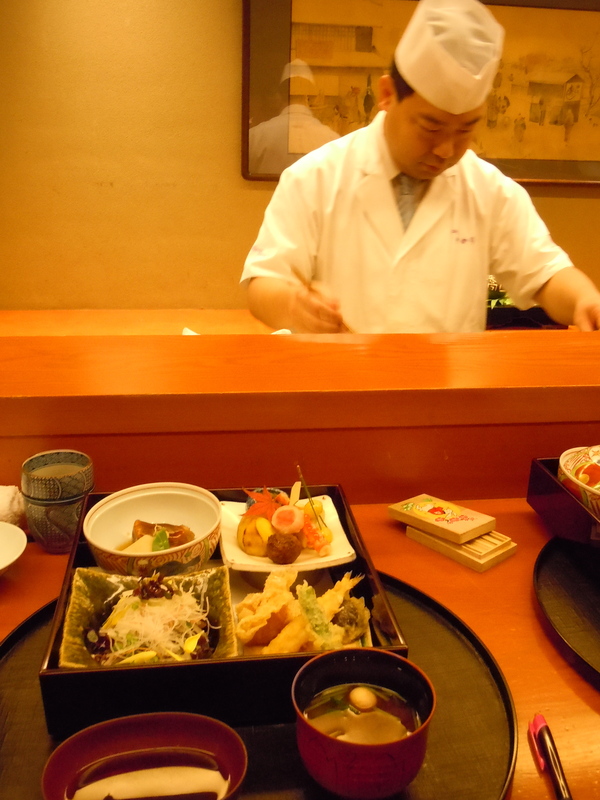 His restaurant is about a three minute walk from Tokyo Station’s Yaesu exit. 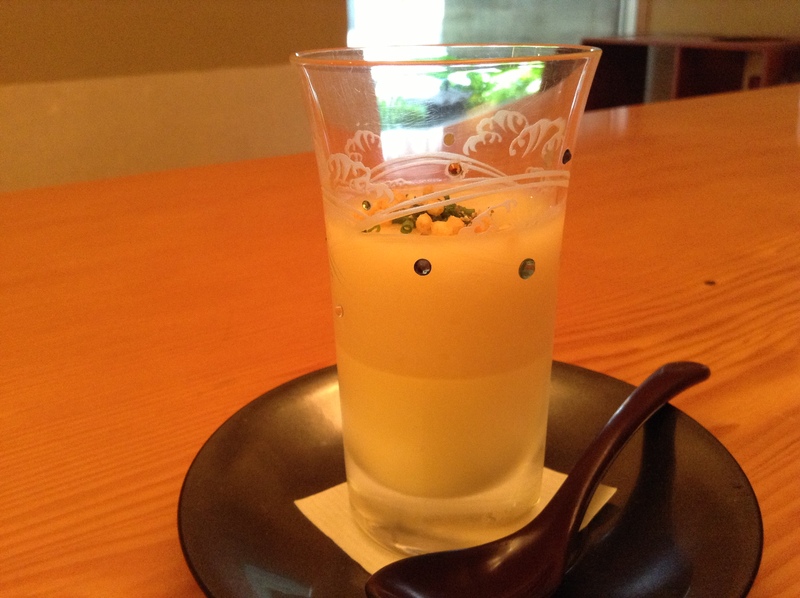 On this chilly spring day he starts his lunch course with a savory, warm egg custard, chawanmushi. 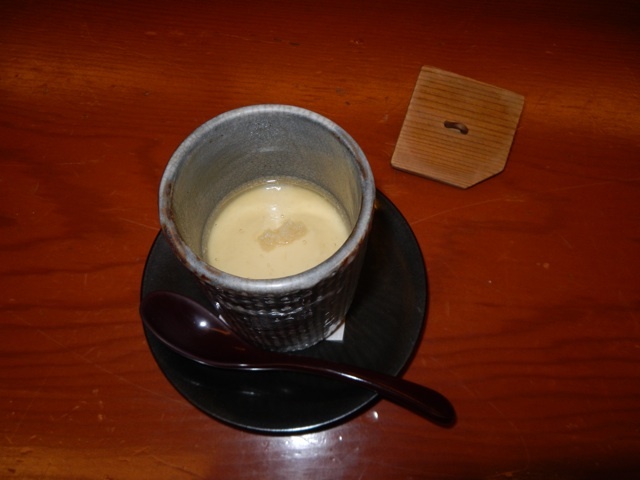 Inside of the custard is anago eel and it is topped with some grated ginger, which helps warm up the body. I like to request a seat at the counter so that chef Nonaga can answer questions about the different ingredients and cooking techniques. He’s very passionate about Japanese cuisine and enjoys sharing his knowledge with diners. He doesn’t speak English so it’s best to go with a Japanese speaker. The bentō lunch needs to requested when making your reservation. 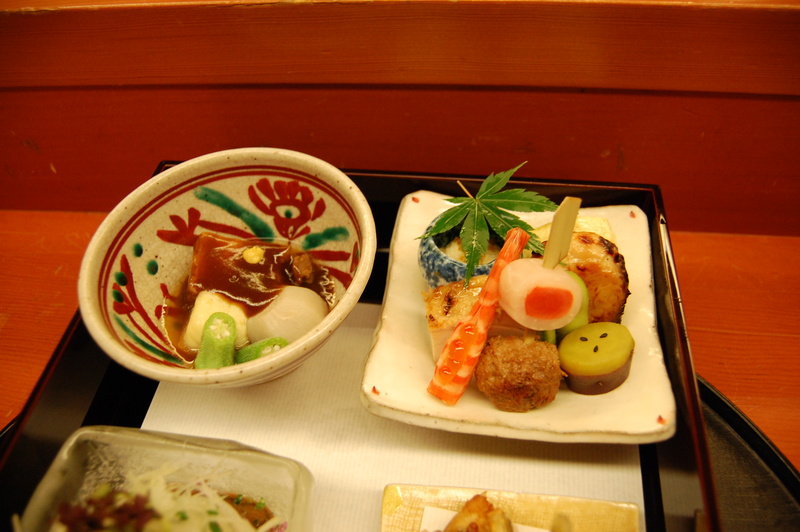 It is a mini-kaiseki meal as it includes a variety of dishes incorporating seasonal ingredients that are prepared using different cooking techniques. 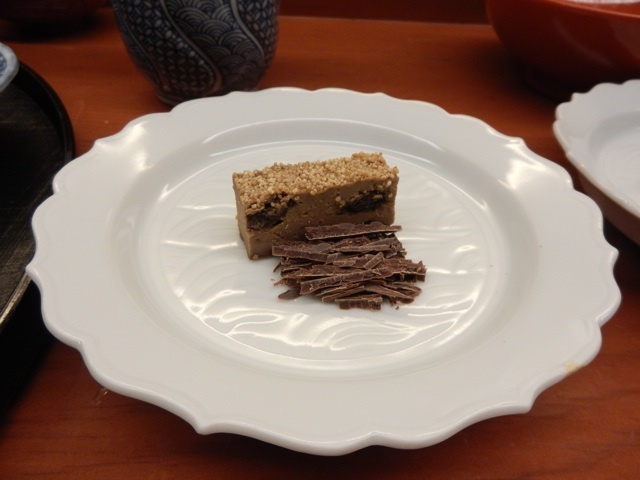 One of chef Nonaga’s signature dishes is a Japanese dish made from chicken liver that is topped with keshi no mi. It is not served with the bentō, but we were talking about Valentine’s Day and chocolate and he paired this with some chocolate. Sashimi topped with a nattō dressing that he created with an Ibaraki nattō purveyor. Tempura of shishitō pepper, shiitaké mushroom, wakasagi Japanese smelt that is is rolled in komé-ko (rice flour) before deep-fried, and kakiagé – a melange of seafood and vegetables deep-fried in a little cake. 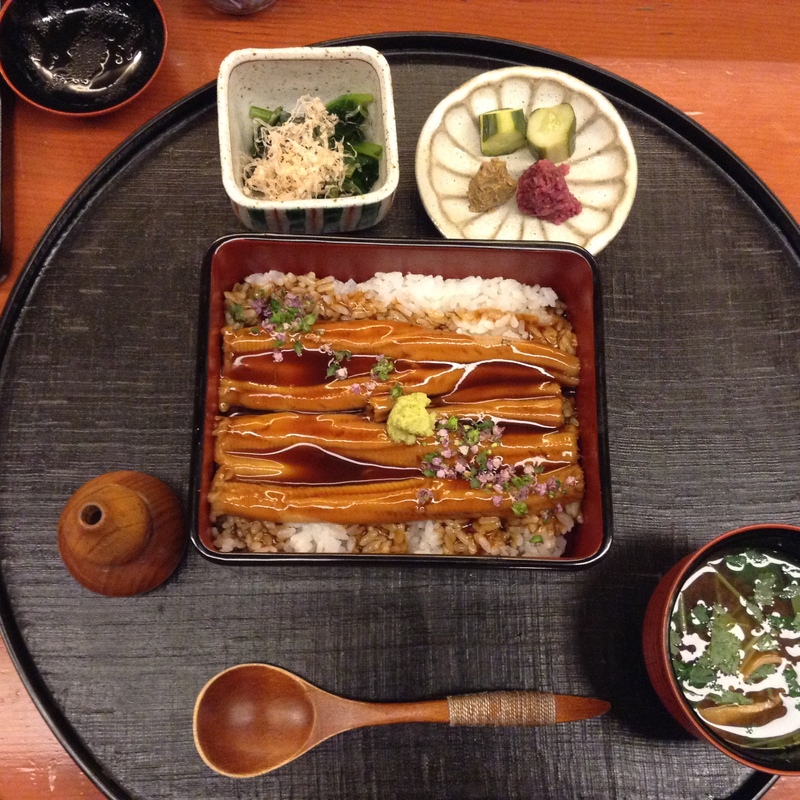 Rice is studded with benidaizu red beans from Yamagata, and more. With the tsukuri, sashimi course, chef Nonaga puts some nattō dressing on it. There was also something crunchy. 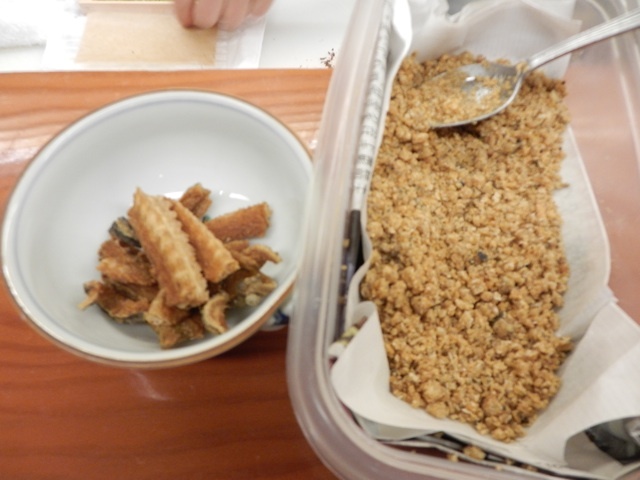 I asked him if it was dried nattō beans and he said that it was deep-fried anago bones. A great example that nothing goes to waste in the Japanese kitchen. Nihonbashi Yukari is the rare kaiseki restaurant that serves dessert. 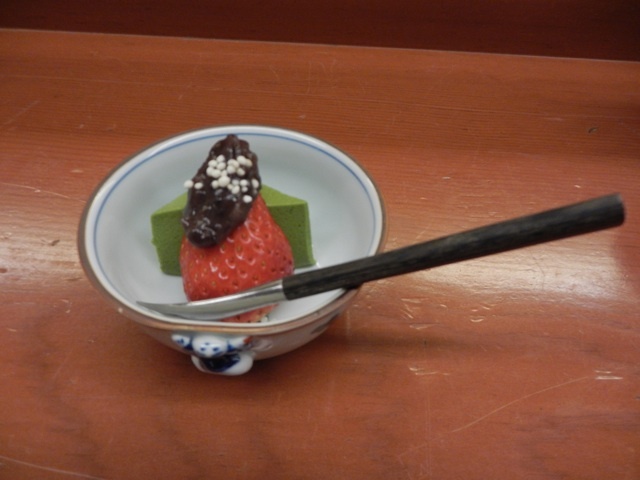 This day it is a mattcha yogurt babaloa with a strawberry from Ibaraki, azuki paste, and wasanbon sugar. And, as if that was not enough, chef Nonaga gave us a second dessert. A cookies and cream ice cream that had some ground coffee in it. There are so many things why this is a favorite of mine. The location can’t be beat as it is in the heart of the city. Chef Nonaga is full of personality and sitting at the counter, I always learn new things about Japanese cuisine. The food incorporates seasonal ingredients – and many of it from Tokyo, including Tokyo Bay. Finally, it is a bargain when compared to similar restaurants. 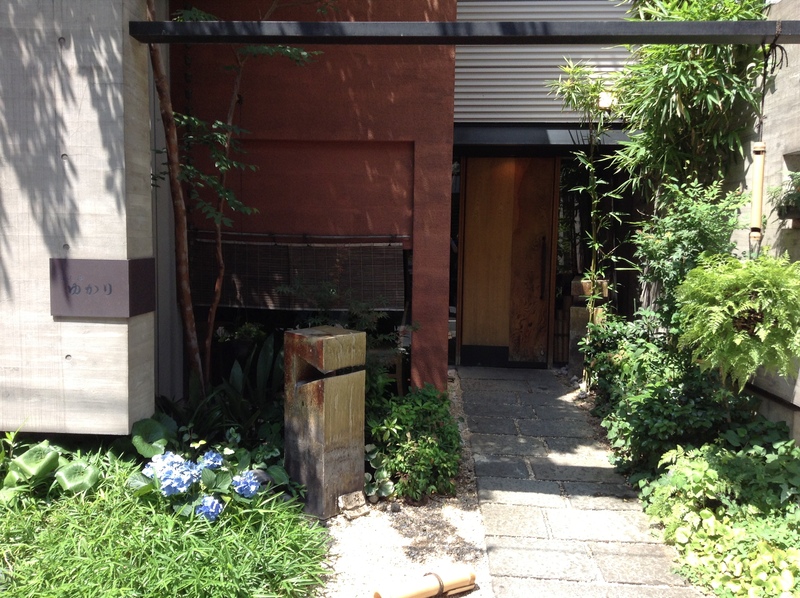 A client recently dined here twice during her stay in Tokyo and she wrote about it on her blog. If you go, please tell chef Nonaga that Yukari sent you. My favorite restaurant in Tokyo is Nihonbashi Yukari. Third-generation chef Kimio Nonaga is the 2002 Iron Chef champion. The food is amazing and I most of all I appreciate chef Nonaga’s passion for sharing Japanese cuisine. He graciously answers all of our questions about the ingredients, where it was sourced, and preparation. He also shares with us current projects that he is working on. On this hot August day we start off with a cold beer as we watch chef Nonaga preparing dishes. Eggplant chawanmushi. Chilled Kyoto eggplant soup over chawanmushi. Topped with eggplant skin sauce, rice arare, and shiso no hana hojiso. Nonaga-san says that the skin which is often discarded has color and flavor. Lovely flavor of eggplants which are at the peak of their seasonality. Yukari bento is much more than a bento. To me it’s like a mini kaiseki meal as it includes many different preparations incorporating seasonal ingredients that are artistically displayed. The lunch bento needs to be ordered ahead of time when making your reservation. On the left: A tender pork kakuni with a sauce of Hatcho miso and kurozato (brown sugar). Chef Nonaga said the whole process to make the pork takes three days to make and that one of his key points was to steam the pork. It is served with fresh awafu, sato imo, and okra. On the right: Katsuramuki daikon wrapped around smoked salmon, toriniku dango, shrimp and ikura, sweet potato, grilled chicken Nambanzuke, sawara Saikyo-yaki, Tokyo tamagoyaki, grated yamaimo topped with house-cured karasumi (bottarga). On the left: Banno natto made with kuromame (black bean) natto from Hitachi, Ibaraki. Include link. Otsukuri (sashimi) of shima-aji, mizudako, and meji maguro. Garnish with daikon, kaiware, onions, shiso, benidate. The banno natto is a dressing that chef Nonaga makes in house. He says that it is good with noodles, seafood, salad, or as a dressing as aemono. On the right: Tempura eggplant, shishito, and kakiage melange of eggplant, shako, sayori, ika, kobashira, and sakura ebi. Chiayu fish rolled in rice arare then deep-fried. The colorful red is momiji oroshi for the dipping sauce. 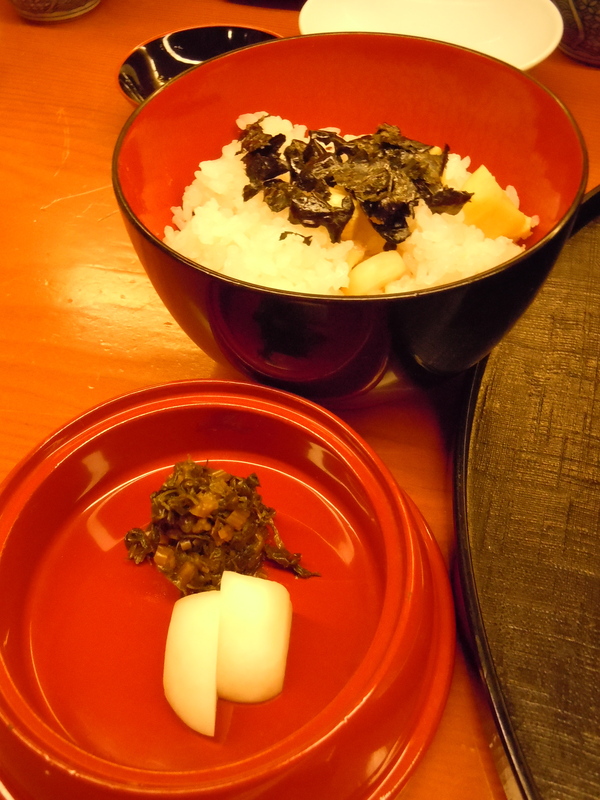 On the left: Rice topped with yukari (dried, red, shiso). Today’s pickles include wasabi zuke made with shoyu kasu and katsuobushi. In the middle: the dipping sauce for the tempura. On the right: Akadashi miso soup with fu, mozuku sea vegetables, mitsuba, and a hint of kona zansho. Chef Nonaga’s signature kinako ice cream studded with black beans. Topped with kuromitsu (brown sugar syrup) and puffed rice. Heaven in a cup. 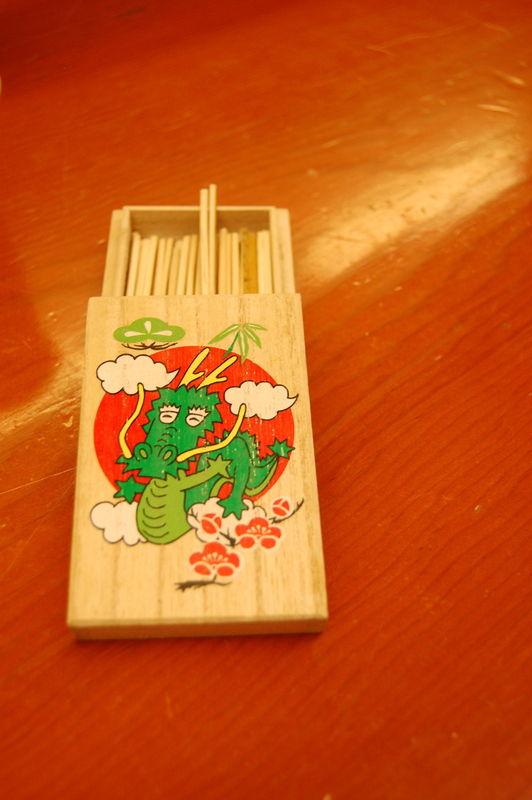 The toothpicks are from a historic shop Saruya. As we went to Nihonbashi Yukari during Obon holidays in August we were curious where he got his seafood as it was very fresh. He said that on days that Tsukiji Market is closed he procures his seafood from the Kyoto Market. I’ve walked in front of Nihonbashi Yukari for years and this is the first time that I have seen these gorgeous chochin paper lanterns. It gives a festive ambience to the entrance. Lunch was very busy, especially considering it was during Obon holidays. Diners were a mix of young and old, men and women. If you come with a large group you can request one of the private rooms in the basement. Nihonbashi Yukari is conveniently located just minutes from Tokyo Station’s Yaesu Exit and around the corner from Nihonbashi Takashimaya. If you go, tell him Yukari sent you. Nihonbashi Yukari is just a few minutes’ walk from Tokyo Station’s Yaesu exit. This third generation restaurant is one of my favorites in Japan for many reasons. For the quality of food it is a great bargain. 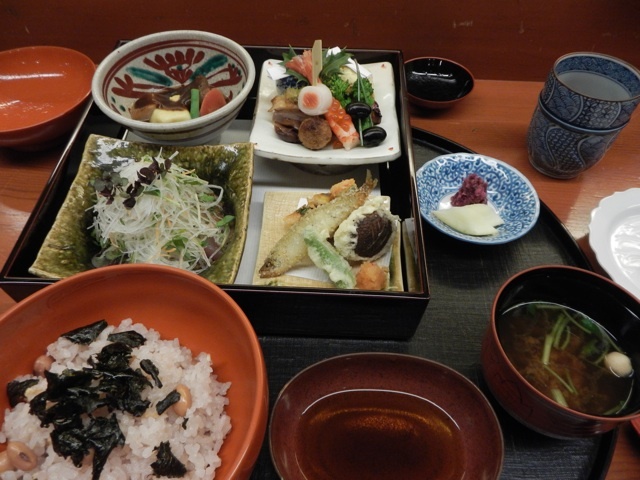 The Yukari bento lunch here is about 3,675 JPY. 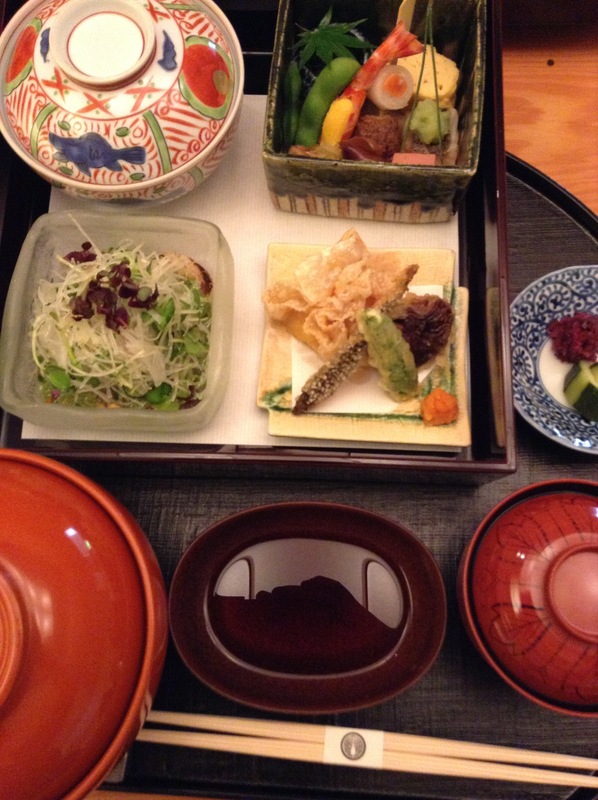 A kaiseki multi-course dinner starts at 10,500 JPY. At this price it is amazing. Second, the chef, 2002 Iron Chef champion, Kimio Nonaga, is very passionate about Japanese food and sharing it with anyone who is curious. No matter how many questions I ask about ingredients or preparation, he is always full of passion in teaching me. Third, the atmosphere is very friendly. 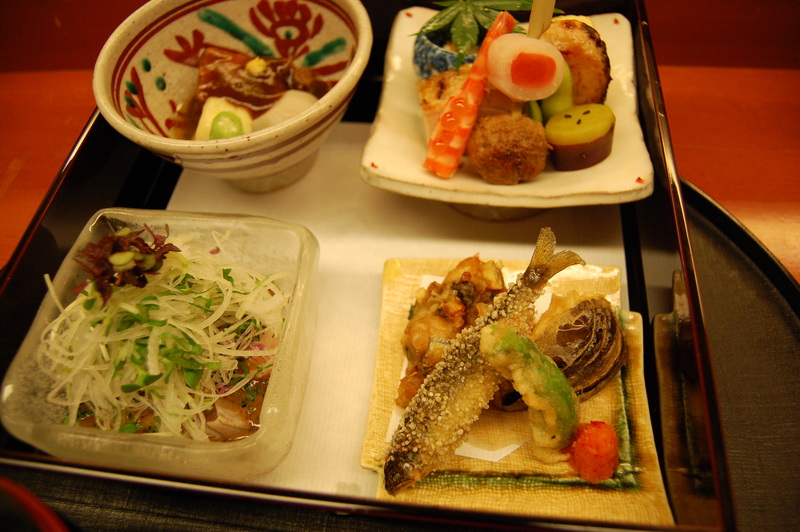 Some kaiseki or sushi restaurants feel like a temple and diners may feel awkward even if they sneeze. Here, diners are warmly welcomed and the whole dining experience is pleasant. Finally, the location can not be beat. Very close to Tokyo station, and a good excuse to stop by Nihonbashi Takashimaya which is just a few blocks away. 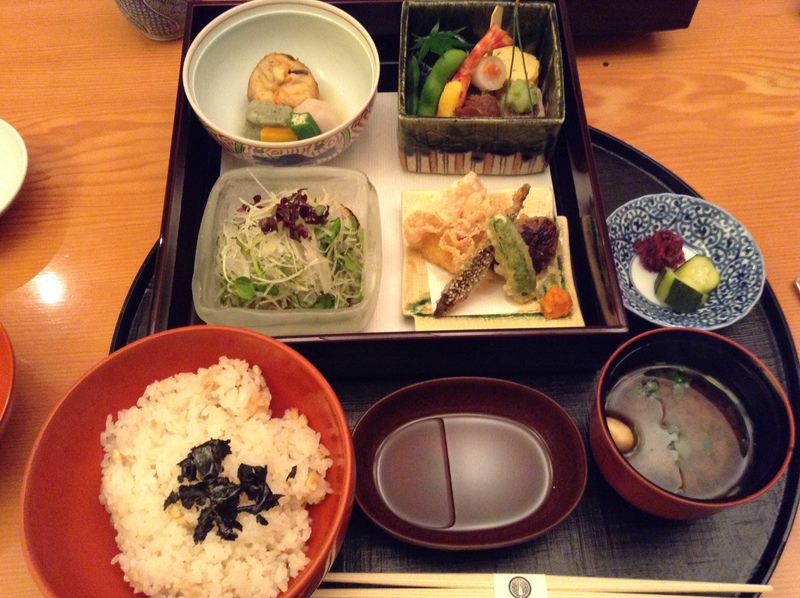 Here is a recent Yukari bento lunch, featuring autumn seafood and vegetables. This has to be ordered in advance as only a limited amount are made daily. If you do go here, please tell him that Yukari sent you. And, when making the reservation, request to sit at the counter so you can watch chef Nonaga at work. 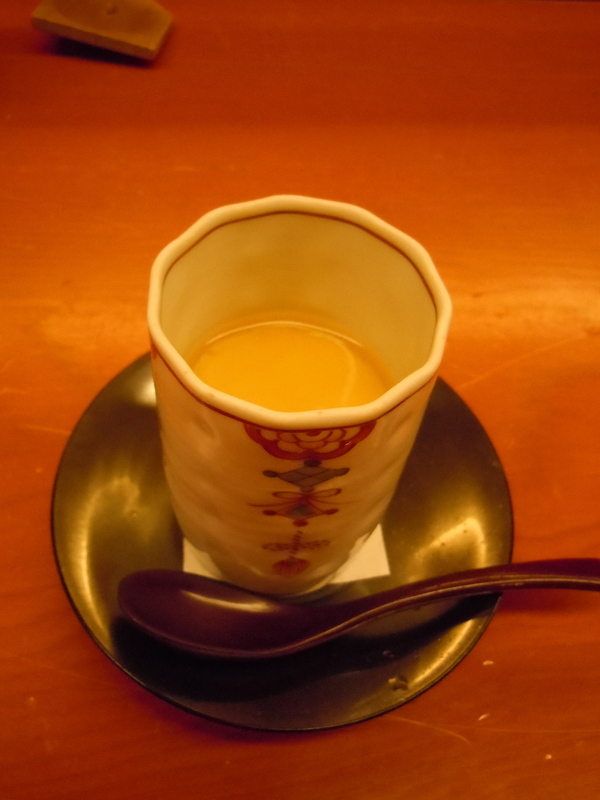 It was a very cold and rainy day that we went so the first course was a warm, savory egg custard with tender anago. A great way to warm up and to start the meal. While this is given the humble name of a bento, it is quite an elaborate meal as you can see. It is also a lot of food. If you are looking for a more simple meal, there is also an a la carte menu. Our neighbors had a nice simmered tai head with gobo that looked very appetizing. The a la carte menu for lunch starts at 2,100 JPY. Inside of the bento are these four lovely dishes. The sashimi course was katsuo, hotate, and tako tataki with oroshi ponzu. 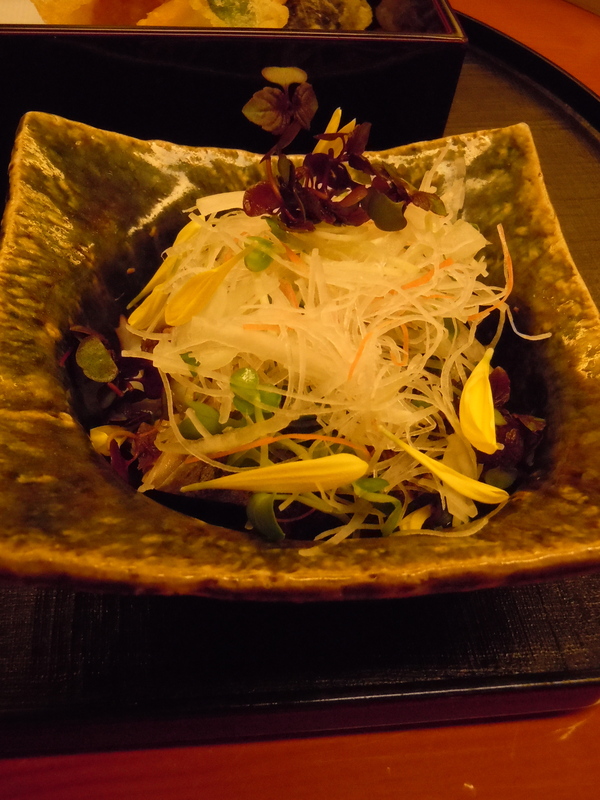 Over the sashimi was julienned vegetables of daikon, carrots, myoga, kaiware (daikon sprouts), kikuna (chrysanthemum flowers), and baby shiso leaves. What really makes this dish special is Nonaga-san’s unique oroshi ponzu. Typically this is grated daikon with a ponzu dressing but the Iron Chef takes 30 different vegetables, grates them, squeezes out the excess juice and then adds the ponzu. It really elevates the dish to a new level. 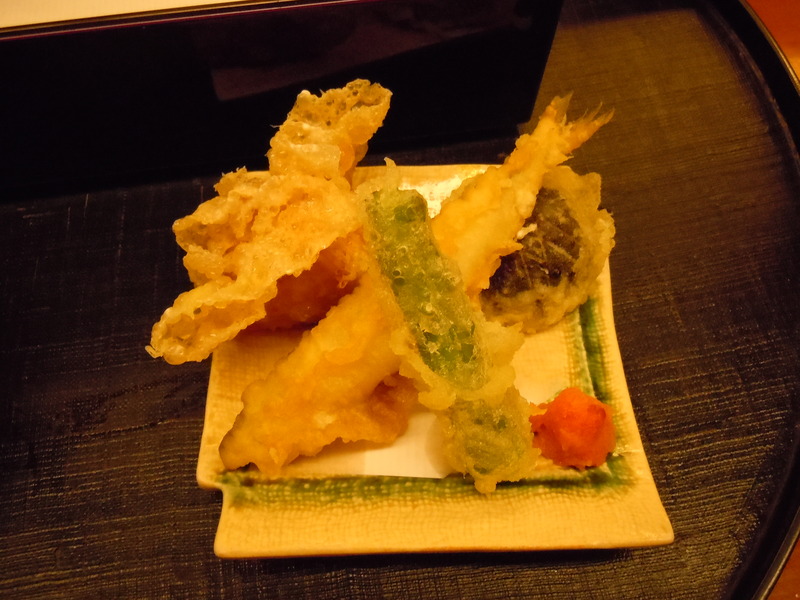 Everything at Nihonbashi Yukari is made from scratch, including the yuba in this tempura course. Today’s tempura was of wakasagi (smelt), shishitou, shiitake, and yuba surrounding a hotate shinjo served with a momiji oroshi (grated daikon with togarashi pepper) and a dipping sauce. The pork was simmered with kurozato (brown sugar) and Mercian kouso wine. 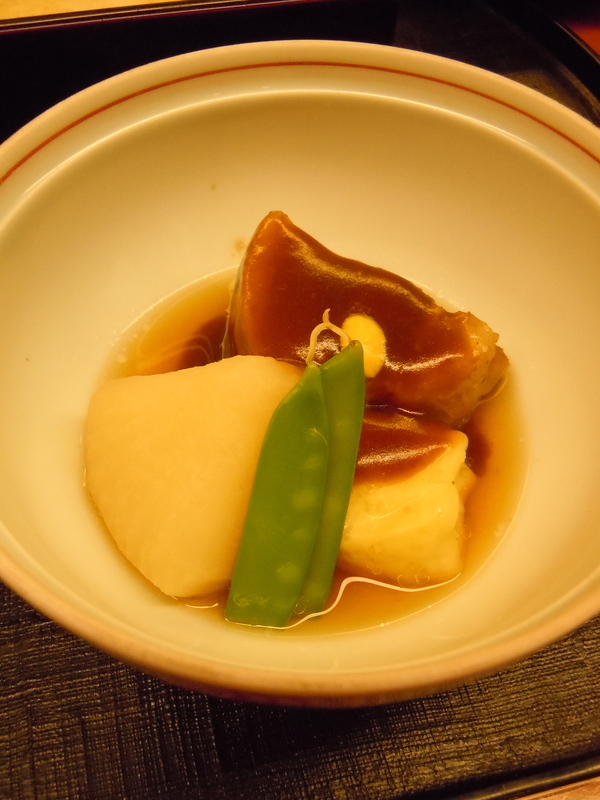 It is served with simmered daikon, snap peas and a lovely nama awafu that has a great mochi mochi texture. Here is the artistry of an Iron Chef. Grilled kuri (chestnut), grilled ginnan (ginkgo nuts), shrimp stuffed with ikura (salmon roe), salmon wrapped in thin layers of daikon, ground duck meatball, dashimaki tamago (Japanese omelet), grated yamaimo topped with karasumi, and grilled sawara (Japanese Spanish mackerel) marinated in Saikyo miso. 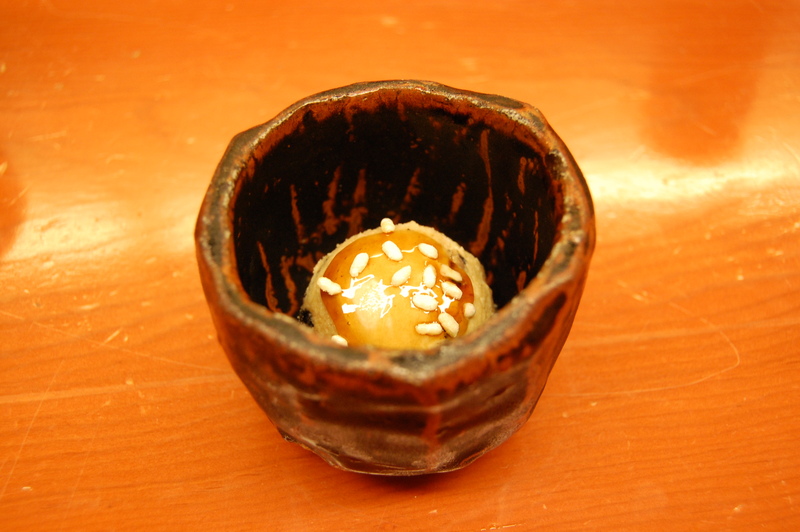 The rice course was one of Shinji’s favorite, kuri (chestnut) gohan served with nuka kabu pickles. Shinji got a second serving of the rice. 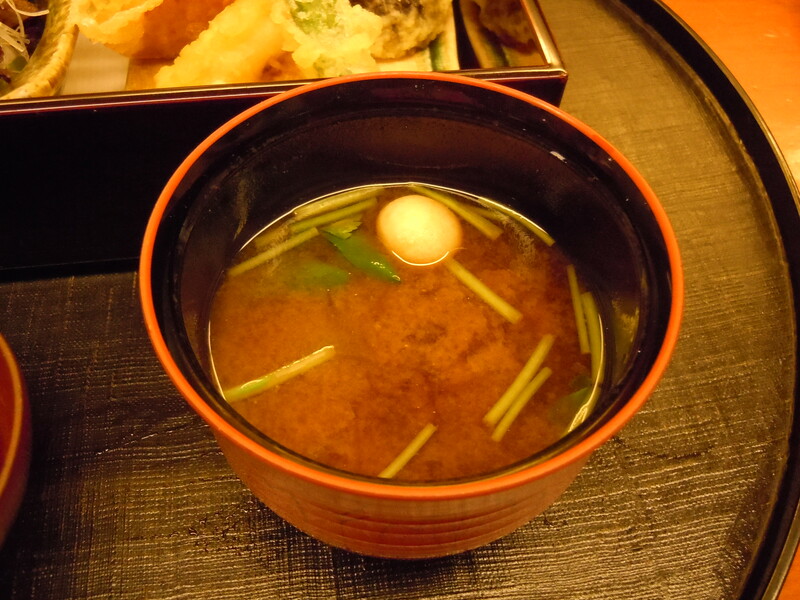 The miso soup had mozuku (a type of sea vegetable), mitsuba, and futama (wheat gluten). Very rarely will you find a Western-style dessert at a kaiseki restaurant like Nihonbashi Yukari. Nonaga-san makes my favorite dessert in Japan. 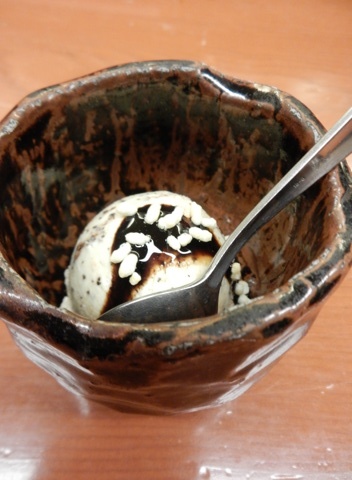 Kinako (roasted soybean powder) ice cream studded with Kyoto Tanba Kuromame (black beans), topped with kuromitsu (brown sugar syrup) and puffed rice. It is not too sweet and has great texture – mochi mochi beans and kari kari from the puffed rice. The perfect end to an amazing meal. I am often asked for my recommendations for my favorite restaurants in the city. Here is my contribution to Food & Wine’s 2009 Go List for Tokyo. Japanese chefs are dictating the world’s dining trends with their fierce devotion to seasonality and respect for aesthetics. For more great restaurants, check out our guide to the world’s best places to eat. Chef Harutaka Takahashi may have a Michelin-starred resume, but he isn’t showy. He turns exceptional seafood into perfect sashimi and sushi in a simple space down the street from Tsukiji Market. We loved: Anago (eel) broiled in a sweet soy-based sauce. Native New Yorker Ivan Orkin faced skeptics when he opened a 10-seat ramen counter in the Setagaya neighborhood almost two years ago. But now, ramen connoisseurs make pilgrimages to eat his homemade noodles doused in a chicken-and-seafood broth and topped with luxurious slabs of roast pork or nests of pickled bamboo shoots. We loved: Whole wheat noodles with slow-cooked charred pork topped with a spicy sesame-and-peanut salad. Insider tip: Ask for the gentei, or daily special. Chuo-ku, Ginza 5-5-13, Sakaguchi Bldg. 9th fl. At this tiny tempura temple, baskets of seasonal vegetables sit on the counter waiting to be battered, deep-fried and served right out of the bubbling oil. 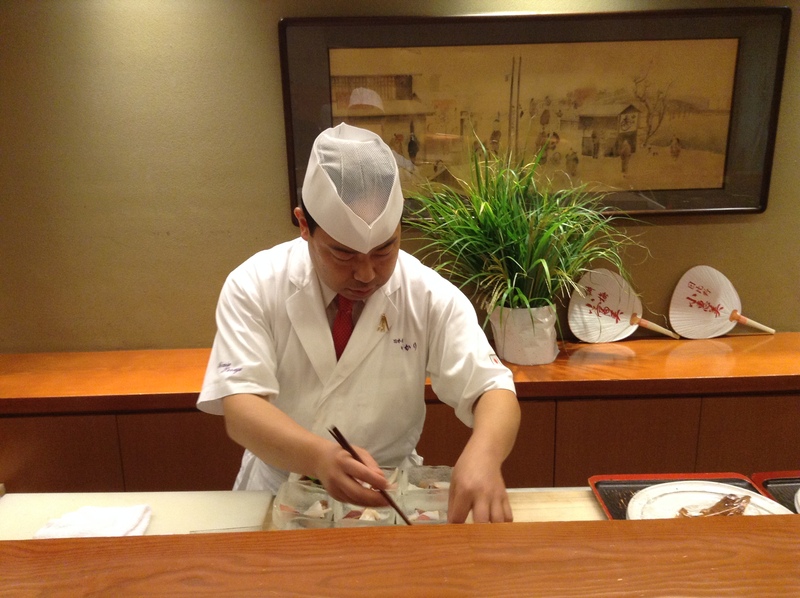 Chef Fumio Kondo carefully monitors the temperature of the oil and the cooking time to create a delicate, crisp shell. He serves sweet soy tsuyu dipping sauce on the side, but purists stick to salt. We loved: Lacy nests of julienned carrots and Satsumaimo sweet potato. At this 100-year-old reconstructed sake brewery, the classic kaiseki courses, like seasonal sashimi and seared wagyu, are delicious. The highlight is soy in several forms, including decadent twice-cooked tofu and freshly made tofu simmering in a hot pot of creamy soy milk. We loved: Deep-fried tofu spread with dengaku miso. Insider tip: The gift shop sells jars of the sweet dengaku miso. Revered chef Hiromitsu Nozaki owns several other places in Tokyo, but he likes to hang out behind the counter at his little kappo restaurant (a relaxed relative of kaiseki) in upscale Hiroo. Nozaki preaches the philosophy of shun, or seasonality, as he assembles gorgeous dishes like uni topped shimeji mushrooms. We loved: Abalone with kimo (liver) sauce and toasted nori. Once renowned for its geisha houses, this area near Iidabashi Station is now called “Petit France” for its many brasseries, bistros and wine bars. Also here are some of the best places to eat nearly every style of Japanese cuisine, like steamed dumplings at 50 Ban (Kagurazaka 3-2), tempura at geisha house–turned–restaurant Tenko (Kagurazaka 3-1) and traditional sweets at Baikatei (Kagurazaka 6-15). Hidden behind the Omotesando Hills shopping complex, this is a classic spot for humble tonkatsu: fried panko-breaded pork cutlets made from prized regional breeds like Okinawa’s red benibuta hog. Shibuya-ku, Jingumae 5-10-1, Gyre Bldg. 5th fl. At this luxe new teppanyaki restaurant, Venetian glass and European art set a fancy stage for chefs grilling extraordinary seafood, vegetables and marbled beef. Seafood from the Izu Peninsula, brought in daily, elevates the reasonably priced lunch specials at this excellent restaurant on a side street behind Comme des Garçons. I am often asked for restaurant suggestions in Tokyo. There is one restaurant that I recommend time and time again. Chef Kimio Nonaga of Nihonbashi Yukari was the 2002 Iron Chef winner, and the trophy is displayed when you first walk in. I love this restaurant for lunch or dinner. For a multi-course kaiseki dinner incorporating seasonal ingredients, you get a meal for a good value. Lunch is also reasonable. 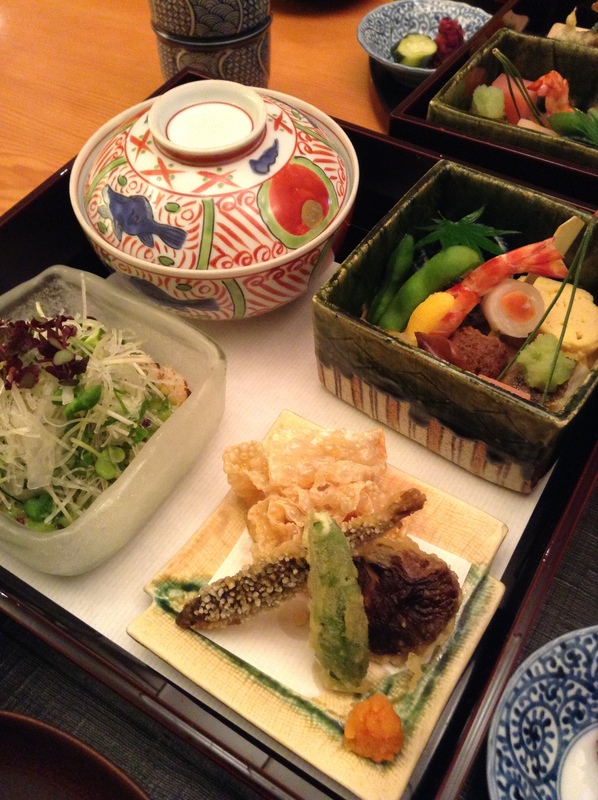 If you want to splurge, call ahead and order the Yukari bento box, pictured here. The last time I went this was 3,675 JPY. The food here is prepared using classic Japanese techniques. Chef Nonaga trained in Kyoto at Kikunoi with Chef Murata, author of the gorgeous Kaiseki book published by Kodansha International. If possible, sit at the counter so that you can watch Chef Nonaga perform his magic. And, tell him Yukari sent you. If you go with a Japanese speaker you can talk to him about the seasonal ingredients, how the food is prepared, and observe his passion for traditional Japanese cuisine.